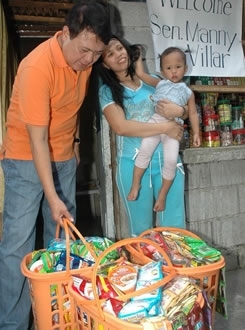 Besides repatriating distressed or troubled OFWs, the Villar SIPAG also provides them livelihood opportunities. The foundation has forged partnerships with various organizations like the Ople Center that can assist returning OFWs gain the necessary skills that will allow them to find employment locally, or better yet, to set up their own enterprises. Many of those who exhibited strong resolve to become entrepreneurs were assisted through micro business start-up packages. Such is the case of Jeanilyn Martinez, a 30-year-old single mother who was repatriated from Jordan in 2008, along with her two-year old daughter who was born there. Jeanilyn returned to her hometown in Bacolod City, Negros Occidental where she has set up a sari-sari store (mini variety store) to have a steady source of income. The foundation provided her with the startup inventory for her sari-sari store. Erlinda Endrinal, 59 years old, is another beneficiary of this program. She was repatriated from Saudi Arabia in 2009 and now lives in Lemery, Batangas. 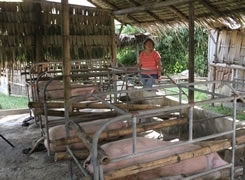 She received a piggery business start-up assistance package. Women and family breadwinners are typically given priority in granting livelihood assistance.